Intersalon is a salon software system designed for all salons. It’s simple, smart and secure. Intersalon now integrates with your existing social networking accounts. Tweet or post your appointment availability or discount codes to Facebook and Twitter. The Intersalon dashboard is essentially a snapshot of your salon's health and how it compares to national averages. Graphs and tables provide a quick summary of no-show issues, new customers and financials. The appointment book is your salon's diary. It shows all salon events, including appointments, holidays and staff breaks.It allows appointments to be added in a single click making it quick and easy for staff. The resource view can also be used to show room availability. Customers can manage their salon account from the salon's own website, viewing order and appointment history and ensuring that their personal details are always up to date. Salon staff can also merge duplicate accounts easily. Spreading the word on salon promotions, seasonal offers and salon news has never been easier. Website news pages, emailed newsletters and SMS mailshots are all simple to create. Online appointment booking is an integral part of the salons own website. It's quick and easy for customers to use and integrates direclty with the salons appointment book. Intersalon can work with your point of sale devices such as touch screens, cash drawers and receipt printers. Salon reports enables the slaon owner to monitor the performance of the salon and its staff. With Intersalon the salon owner doesn't even need to be at the salon, they have the information they need whenever and wherever they need it. 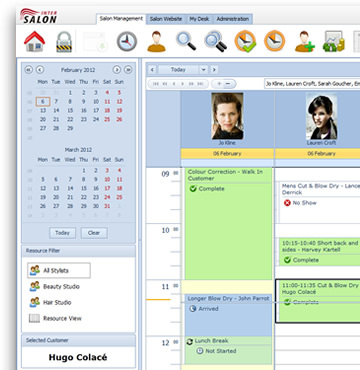 With one Intersalon salon software system you can manage and run multiple salons. Intersalon simplifies the process of selling salon products online. It has a built in shopping cart which links directly to the salons products to make becoming an online merchant as simple as a click of a button. Price increases can be manually adjusted on a per product basis, or as a global percentage increase across your range. SMS text messages have been proven to reduce no shows. Intersalon allows SMS appointment reminders to be scheduled and the content of the message personalised. Intersalon now comes with a selection of themes or skins for you to choose from. We add additional themes with each new version of Intersalon. With Intersalon, you can access your salon business from anywhere in the world, whenever you need to. Plan ahead without the need to head down to the salon. A salon website is provided with each Intersalon salon software system.The website is fully configurable and has the latest website features to ensure that the website truly reflects the essence of the salon. Intersalon logs all changes made to the appointment book, settings and commission logs. Almost any operation attempted is logged - so you'll know exactly who did what in your salon. Intersalon is available globally. It can be customised to fit all your specific business needs in terms of business type e.g. hair, spa or beauty and support multiple language and currency types.